OCZ's next generation Vertex 2 SSDs are already in pre-production it seems, and the "quad RAID" interface manages to spew out a whopping 550MB/s read and 480MB/s write performance according to ATTO disk benchmark. That's in complete excess of the current SATA 3Gbps specification, meaning we'll have to wait until SATA 6Gbps in order to use it properly, and even then if these speeds are seen in realworld tests - we'll be needing the next-next gen SATA instead! There's remarkably little detail other than this, with no comment on whether the drives are MLC or SLC based, whether it still uses a JMicron controller (the Vertex 1's do not apparently) and how much onboard cache is used (the Vertex 1s have a large 64MB). Fudzilla claims the drive will be ready for CeBit in March, which makes us wonder - why? The Vertex 1s are barely even out the door, so why buy one of these instead of just waiting for a few months for version 2? And even then, without a SATA 6Gbps controller that no motherboard has - the drive will be largely bottlenecked by the current SATA standard. But is it good news for the future? Huge gains in storage performance are what's needed to unbottleneck our PCs! We're still wanting to know how much this premium drive will cost, and whether its real world performance solves the current read-write stuttering that plagues current SSD technology. Are you interested in a Vertex 2? Let us know your thoughts, in the forums. Addendum 15:30: We've been told that apparently it was a technical demo/simulation by OCZ, and not yet near a final product. 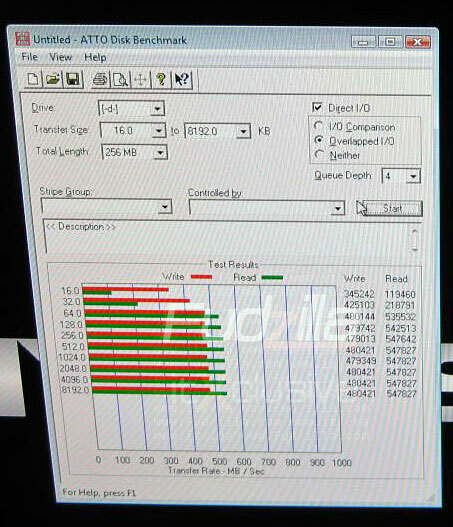 OCZ Vertex 2 SSD ATTO disk benchmark - Image Courtesy of Fudzilla.